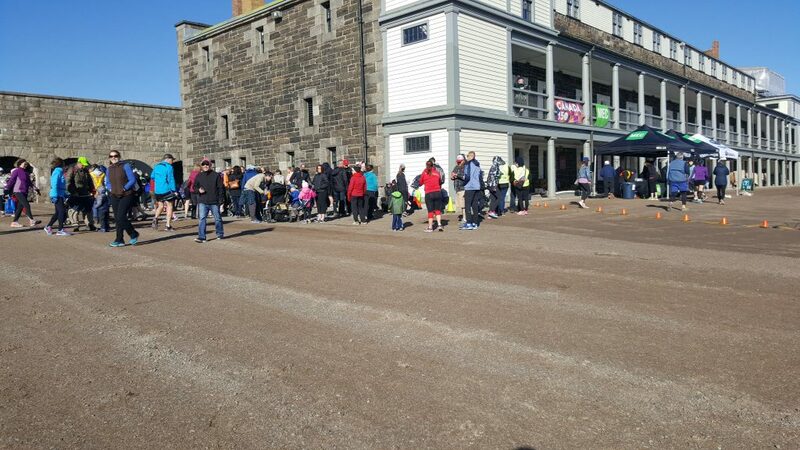 While planning for my Halifax-Toronto trip in April, I remembered to search for a road race and found out about the Citadel Highlander (MEC Halifax Race Two) taking place the first full day I’m in town. In a previous year, I think I narrowly missed being in town for this race. I don’t know why I hemmed and hawed about registering right away and so I did register later the same day I learned about it. It only costs $15! But the timing of the race started to weigh on me. I was arriving in town at 10 p.m. the night before with the kid who would be seeing his grandparents for the first time in several months. He hadn’t really warmed up to my mum back in December. If I brought him to the race and then take off and run and leave him with these people strange to him, would he cry inconsolably and make himself throw up and embarrass and freak out my parents? Would I have the option to carry him in an Ergo (although he’s no longer accustomed to it)? Yes, a race representative told me. But closer to race day, I wondered how I was going to dress him and bring him to the race considering the 9:30 a.m. start was equal to 5:30 a.m. in Vancouver? Am I a horribly selfish person to drag him up? My mum said simply that I just didn’t have to go to the race. That is certainly true. When it came to the day, E was sleeping peacefully still and I figured he “shouldn’t” wake up until I had been out for a while, until I was well into my race. My parents were armed with toys to amuse the kid and food to ply him with. So I left the house with not a little apprehension, in time to arrive around 8:20, ahead of race day package pick-up closing. I overestimated how long it would take to get to Citadel Hill and to hike up the hill from the parking spots necessarily at the bottom of the hill. Thank goodness for ample free parking though. As I walked up the hill, I was immediately grateful I thought to wear a long sleeve top – just thin cotton, not a tech or athletic top – that I found in Lil Sis’ closet, clothing from a lifetime ago, when she lived in Halifax and left there so she would have some clothes options when she visited. The wind was whipping all around as I walked up the hill alongisde a family who sensibly wore toques. At least I wasn’t in just a T-shirt. At the top, at package pick-up, they could barely keep everything together, there was so much wind and they were not sheltered at all. And you could tell where you could get some relief from the wind which was next to a stone wall of a building because everyone was standing there! I saw a family tying on black watch kilts, flimsy looking handmade ones that were made on a wrap skirt style. I felt a twinge because I hadn’t arranged that my mother dig up any of my old kilts. Then I realized those kilts were issued by the race, that more were going around and I was going to be a part of it! Practically speaking, they were a barrier at your nether regions against the cold whipping wind. We started to rearrange along the wall because the kids race (1K) would start at 8:45 and they ran by the wall that increasingly more runners stood by. A small part of me wanted to capture the kids breaking out in a run. Mostly, I couldn’t wait for E to be able to participate in a kids run and for me to lead him through it! The minimum age is usually five, so just over three years away. After the kids set off, I wandered over to the two 78th Highlanders who were responsible for shooting a rifle to signal the start of the races. They are actors, not actual military and complied with my request for a photo. And I asked at a good time because a minute later, they were back at work, standing at the finish line giving high fives. I obviously don’t attend kid races because it took me a moment to wrap my head around the time it took them to run a kilometer, like under three minutes! So, that race was mostly done inside of 10 minutes and we settled in to wait another half an hour for the start of the 5- and 10K. Thank goodness I hadn’t brought E and my parents. It was not so interesting on the grounds, he would have been miserable with the wind and we would have stood waiting endlessly and so awkwardly. By the time 9:30 rolled around, my enthusiasm had significantly waned. For a 5K race and how long I would be racing, the wait to begin seemed inordinately long. We crowded behind the no frills MEC arch and listened to the opening comments. In the five years of holding the race, apparently they had not been able to use the same route twice whether a security concern or weather or course conditions, I don’t know. The possible route map posted before the race declared it is not the route and after the race, the route map still doesn’t reflect the 2017 route. So I never studied it and assumed that I would just follow the crowd and it was just one loop around the fortress, right? I set out a little too fast at the beginning but my definition of fast has been adjusted lately. Nonetheless, the crowd around me spurred me to keep going. 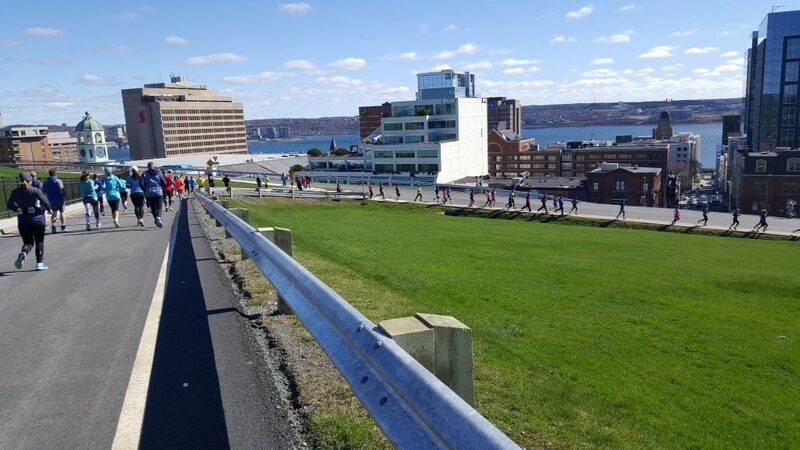 Over the course of my time on the race route, I found that few people paused their running to walk. I did, at the 20 minute mark – which is no small feat for me – because it seemed like we were endlessly running up and down the hill (but at different points of the hill), going as far down as the street. At the 20 minute mark, another problem set in in that the race route started to get confusing. The 10K route was roughly twice around the 5K course but the 5K course itself was two loops (or 1.5 loops). We came across a volunteer who was verbally telling us that if it was our first time passing by her, we should go down the hill and if it was our second time, to continue going straight. But did she know if the 5Kers have to go down that steep hill again? No, she did not. We came across another volunteer at the top of another hill saying the same and we simply can’t remember who we’ve passed before or not. It did not seem like a reliable set of instructions. Later, we would see volunteers with chalkboards that indicated which way first and second loops should go. I was perplexed because wouldn’t 10Ks, who were starting to lap us, be passing some points three or four times then? Of the ad hoc trio of us, one lady checked her GPS and announced had run 4.2 km so far. I asked but then forgot if they were 10Kers or 5Kers but they took off down a hill that I was loathed climb back up and I broke from them and kept going. Perhaps they were doing the 10K while I wasn’t. So I kept chugging along back towards the entrance to the fort, leaving the ring road. At the entrance to the fort grounds, there was another sign about which direction to go in and I lost count so I turned into the fort. As I did so, I crossed the bridge and saw people running through the usually restricted access trenches and sally ports below. Perhaps that was the next segment of the race course I was getting to now that I left the endless looping on the ring road. If if I missed out on the full 5K, I wasn’t crossing the finish line with such a fine time that I was taking anyone else’s age group medal. But soon after entering the fort, the course branched either to the finish line or to continue with the 10Kers. I certainly didn’t want to end up on the latter course and do 10K if there’s no opportunity Choose My Own Adventure. What was the kid up to and was he wailing for me? So I ran through the finish line with a respectable-looking 5K time except that I might only have run about 4.6K. So, did I do a 5K? Not likely. 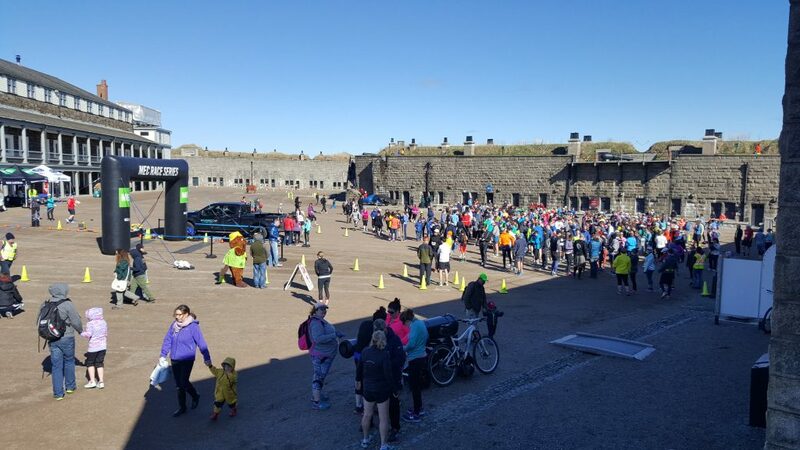 Do I feel comfortable crossing the Citadel Highlander off my Marathon Bucket List when I didn’t run through sally ports? Not really… Was the part in the trench even part of the 5K race? I’m not even sure! Does it make sense how I’ve been particularly reluctant to draft this blog post then? I would hope so.